South Korea and the European Union (EU) will launch their fifth round of negotiations in Brussels this week with both sides intending to make a breakthrough in some sticky issues, including a dispute over auto trade..
Fresh from reaching a trade accord with the United States in April this year, Seoul has held four rounds of negotiations with Brussels on a free trade agreement that could provide Asia's third-largest economy with a commercial bridge to Europe. However, previous rounds of the negotiations hit snags over auto trade as both sides remained reluctant to sweeten tariff offers to each other. The fifth round is scheduled to be held from Nov. 19..
On Nov. 21, Kim Han-soo, South Korea's chief negotiator for the trade negotiations, said Seoul has sweetened offers to Brussels in an attempt to make a breakthrough in the negotiations. "In order to help trade negotiations with Brussels go smoothly, we have improved our own tariff offers, and the revised proposal will be sent to this week," Kim told reporters. Kim stressed, however, that Brussels should make a new proposal on tariffs and others to the same extent that Seoul did. "Both sides should exert an effort to make a breakthrough in the upcoming talks, and could speed up the pace of negotiations," he said. Ignacio Garcia Bercero, Brussels' chief negotiator, said last month the fifth round would be key to predicting the possibility of reaching a deal. "This round (in November) is going to be key in order to see whether or not there can be much progress for the conclusion of these negotiations," Bercero said. The 27-nation economic bloc is demanding that South Korea cut tariffs on cars and other products to the same extent that it did for the U.S. this year in a free trade agreement. Since the first round started in May this year, the EU has offered to eliminate or phase out all its import tariffs on South Korean goods within seven years, and remove tariffs on 80 percent of goods within three years after the deal comes into force. But the EU expressed disappointment with South Korea's offer, saying it falls short of the accord South Korea signed with the United States in June. In particular, Brussels wants Seoul to cut regulations for European carmakers by applying international standards instead of different domestic rules. The EU has made a new proposal on tariffs for autos that Seoul is now reviewing. South Korea held out for an improvement in Europe's offer to eliminate a 10 percent tariff on imported autos within seven years. 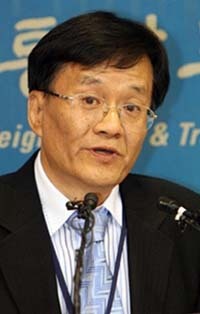 Officials said Seoul may propose the early lowering of the EU's import duties on cars and electronic goods. So far, both sides has said they want to maintain tariffs on cars and some electronic products for up to seven years.